UES (Horizontal) or UESV (Vertical) Split casing pump is designed by our company for the demand of Energy Efficiency, which combined the advantage of the word well-know manufacture. Designed and Focused on the application of the current advanced ternary flow theory, CFD,CAE..the pump Efficiency over the world leading level, has the advantage of excellent structure, smooth operation, low noise, easy maintenance and many other advantages, have the ultra efficiency and energy saving advantage. it is upgrading of split case pump. Which is widely used in the power industry, water conservancy industry, steel industry, petrochemical industry, water project, municipal , waste water treatment, shipbuilding industry, mineral exploration, aviation industry and other industry. Double volute design for pumps with single head over 160m, completely balance the radial force and ensure reliable service and save your maintenance costs. Horizontal and vertical construction allow your flexible installation request. Foot support and centerline support is optional for your flexible application. The Pump are biaxial Structure for both rotation clockwise (CW) and anti-clockwise (CCW). Optional shaft sealing for single seal mechanical seal, double mechanical seal, cartridge mechanical seal and soft packing. Optional stuffing box cooled by third coolant, bearing bracket with cooling jacket or finned shape to allow the pump to transfer your very hot liquid. 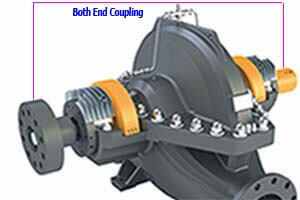 Normally the suction and discharge Flange is horizontal at the same centerline. EU-Flo Pump can also supply suction nozzle is down or vertical, discharge nozzle vertical to fit your pipeline arrangement. Bearing lubrication is optional for grease or oil. Sleeve bearing is also possible. Optional bearing temperature and vibration sensors allow you to know the working of the pump. IEC-Ex Standard is as option.